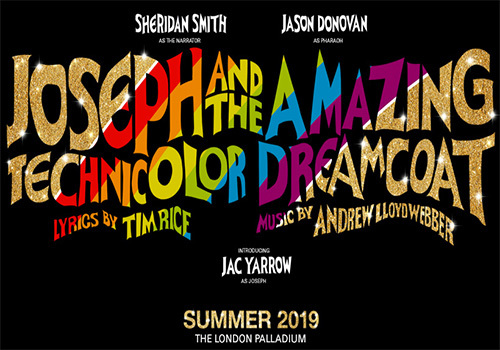 In fitting celebration of its 50th anniversary, Joseph and the Amazing Technicolor Dreamcoat plays at the London Palladium for a limited summer 2019 season. Andrew Lloyd Webber and Tim Rice's vibrant musical was last staged in the West End back in 2007. Boasting an entirely new cast and creative team, the latest incarnation promises all the beloved songs, such as "Any Dream Will Do", and opens from 26th June 2019. Based on the biblical tale of one Jacob's favourite son, the show follows Joseph after he receives the gift of a magnificent coat from his father. His luck takes a dip after he is sold into slavery by his dangerously jealous brothers. The story started out as a 1969 concept album before receiving its professional debut at the 1972 Edinburgh International Festival. It has gone on to enjoy soaring success; it has been translated into a movie, toured extensively, performed by amateur and school groups and even sparked a reality TV series to discover the next Joseph for the stage. Its soundtrack is famous the world over, including numbers such as “Any Dream Will Do” and “Close Every Door to Me”. Among the most famous composers living today, Andrew Lloyd Webber has composed 13 musicals so far, including long-running hits such as The Phantom of the Opera and School of Rock. Besides this, he has written a Latin Requiem Mass, two film scores and a song cycle. He has received myriad prestigious awards for his troubles, and has been knighted. Tim Rice, a frequent collaborator of Lloyd Webber’s, is one of the most highly celebrated British lyricists. He worked with Elton John on Disney's The Lion King and with Alan Menken on Disney's Aladdin, to name just a couple of his most famous contributions. He too counts a knighthood and many awards to his name. Double Olivier Award-winning Sheridan Smith (Legally Blonde, Funny Girl) will be stepping into the role of the Narrator. She is joined by Jason Donovan, who will play the Pharaoh. Donovan played the titular role of Joseph at the Palladium 28 years ago. Donning the colourful coat will be recent drama school graduate Jac Yarrow, who makes his professional debut. Laurence Connor (School of Rock) directs, alongside choreographer Joann Hunter, designer Morgan Large, lighting designer Ben Cracknell, and sound designer Gareth Owen. Joseph and the Amazing Technicolor Dreamcoat is a joyously vibrant classic that you won’t want to miss when it rolls into the London Palladium in June 2019. Note: Jason Donovan will not be appearing in either performance on Saturday 13th July. The appearance of any particular artist is not guaranteed. Joseph and the Amazing Technicolor Dreamcoat is a family show.